Fred Williams has come home to Melbourne. The retrospective of the much-loved painter of the Australian (and particularly Victorian) landscape began last year at the National Gallery of Australia in Canberra. Fred Williams: Infinite Horizons is now showing at NGV Australia at Federation Square. It is fascinating to see how, in a large survey show of this kind, the pictorial language – the signature style and personal vision of a major Australian artist – developed over a lifetime. Williams’ work was ever changing. Like every artist, Williams had to discover his direction for himself. 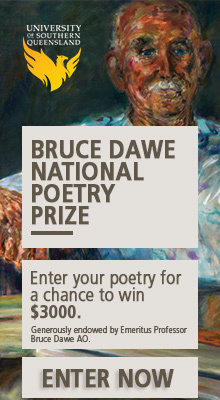 He spent years at art school – first in Melbourne (1943–50) and then in London (1951–56). Mostly he was making figurative work. 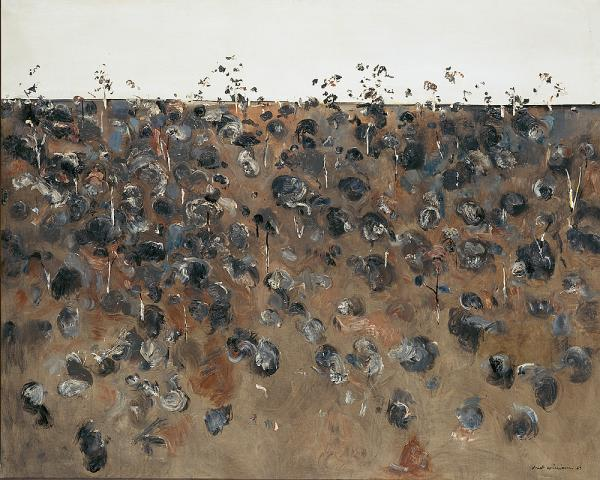 It was only upon his return to Melbourne in 1957, aged 30, that Williams committed to painting our landscape. This essay is focused on a selection of these paintings, all included in the retrospective, over the course of the artist’s career. What do these paintings say about how the artist engaged with the landscape? How do we, the viewers, engage with the landscape in these works? 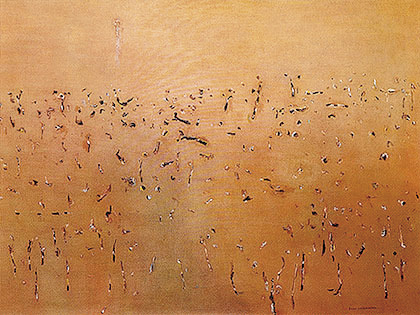 The Nattai River (1958) is a painting from Williams’ formative period and is in the collection of the National Gallery of Victoria. The Nattai River, by virtue of its subject, composition, and use of patches of colour, clearly reveals the influence of French Post Impressionist Paul Cezanne. 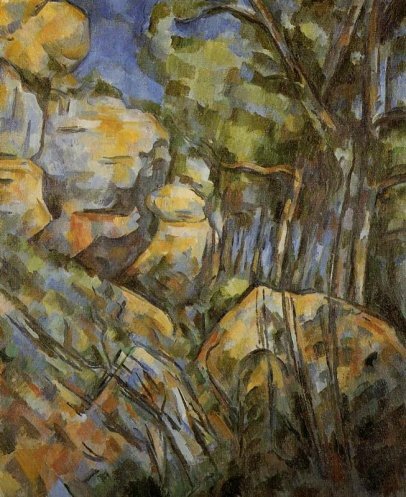 The exhibition catalogue seeks to acknowledge these similarities by placing the Williams next to Cezanne’s Rocks near the caves above the Chateau Noir (1900–04). Yet the two paintings have quite a different ‘feel’ and this difference has much to do with the artists’ particular working methods. Cezanne has made his painting in the open air. He is registering in each brush stroke and patch of colour a tactile sense of placement and distance. Time enters the work as the painting registers a multitude of moments of seeing. The viewer is encouraged to spatially enter and explore Cezanne’s landscape, even as the landscape presses up against the flat picture plane. Williams’ painting was made in the studio. The landscape does not feel as if it has been experienced in time and there is a pervasive sense of stillness about the painting. There is not that contrast between the shimmer of light and the solidity of the rocks that gives dynamism to the Cezanne. Curiously, though the rocks and trees in the Williams painting appear to be at a further remove than in the Cezanne, The Nattai River does not register much sense of spatial recession. Rocks, hill and trees appear more flat by the way they seem to occupy the same plane (stacked on top of one another). In contrast to the Cezanne, Williams’ painting is not a transcription of sensations that evokes a touching of the landscape and hence a bonding between artist and subject. The Nattai River does not embody the tension between form, space, and flatness that animates the painting by the French master. There is a distancing evident in the Williams landscape that is, to a greater or lesser degree, a feature of the artist’s oeuvre. In the early 1960s Williams’ art went through a major development. At this time we see the emergence and consolidation of the artist’s ‘classic’ style. This development involved a series of Upwey paintings and of You Yang paintings that occupied the artist for many years. Upwey landscape (1965) is a highly regarded painting held in the collection of the National Gallery of Victoria. At the time the painting was made, Williams was living at Upwey in the forested Dandenong hills, an hour’s drive east of Melbourne. In comparison to The Nattai River and the artist’s work of the 1950s the landscape has opened up. An emphatic horizon line, hereafter a stylistic feature of much of the artist’s work, divides the painting into two abstracted zones representing land and sky. The viewer’s eye is drawn into the distance. Yet Upwey landscape, which lacks a foreground, is, if anything, more abstract and flat than The Nattai River. The surface paint qualities have changed. 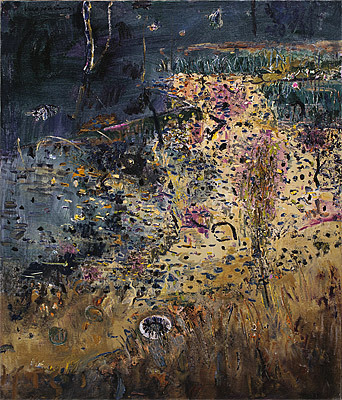 While The Nattai River has a smooth and even paint surface (Williams’ painting of the 1950s consistently used a glazing technique where the paint was applied in thin transparent layers) the paint in Upwey landscape is more differentiated: ranging from thinly stained canvas to thick impasto mark making. The paint in Upwey landscape is applied with greater vigour and decisiveness. A sense of process – the making and construction of the work – is more apparent than before. In essence this process seems to have two distinct stages. First, the laying in of an all-over ‘ground’ of thin paint in a mid-tone, perhaps wiped back with a rag in some places and overlaid with semi-opaque thin paint in other places, probably using a brush. In the second stage, impasto (thicker) paint is applied. Various tints of white are used for the sky, obliterating the ‘ground’. Rounded, blotchy dabs in dark tones – representing trees, logs, rocks and other landscape debris – are scattered over the other three-quarters of the painting. Those areas where the ‘ground’ is left exposed represent the land itself. Upwey landscape is quintessential Williams. We see a landscape that looks unmistakably Australian. It is flat, brown and dry, with scattered and unkempt looking tree cover. This is a landscape ragged and unorganised in appearance, typical of what is to be seen when you drive out of Melbourne, particularly north and west, and into the Victorian hinterland. The canopies of trees furthest away along the horizon are represented by dabs and broken marks. Thin white vertical lines symbolize the tree trunks and dead trees of the landscape. By the late 1960s Williams had pared down his pictorial language to the minimalism evidenced in Yellow landscape. 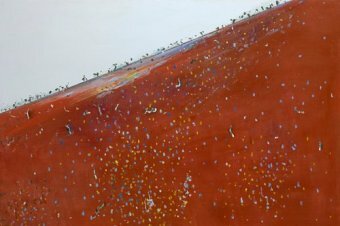 Made in 1968 – 69, and in the collection of Geelong Gallery, the painting is a fine example from the end of the You Yangs series. The You Yangs are an hour’s drive to the southwest of Melbourne, not far from Geelong. These are granite hills and peaks, and present an elegant and even dramatic contrast to the surrounding flat landscape. Williams would travel to the You Yangs by car (the artist famously did not himself learn to drive). Here he would observe and make studies of the surrounding country as seen from the You Yangs . Studies were also made of the hilly, treed and rocky landscape as seen within the You Yangs. In Yellow landscape, the flat ‘ground’ asserts its primacy over the whole surface of the painting. This is ‘all-over’ abstraction, and is in part an expression of the influence of American colour field painting of the time. The impasto mark making is more scattered than in Upwey landscape in keeping with the drier and less forested landscape. The marks are smaller than before and look like dots, lines or squiggles. The horizon line has been replaced by what can be read as a broken tree line. This implies a division between land and sky, though the quiet space beyond the tree line could also be read as open space and grassland. Yellow landscape has a decidedly decorative appearance, and a liveliness, which serves to mitigate any sense of melancholy or emptiness that can be associated with such a reductive pictorial language. Both Upwey landscape and Yellow landscape evoke the spaciousness of the Australian landscape, yet the paintings are resolutely flat. They seem to represent a section of cropped landscape that spreads out left and right in all directions beyond the edges of the painting. No framing devices suggest a self-contained view. The eye is led nowhere in particular but is encouraged to dance about in a random kind of way as if connecting the dots. Perhaps the eye comes to rest at the tree line – a point of equilibrium. It is difficult for the viewer to spatially enter these two landscapes. There is no solid foreground on which the viewer can imagine themselves standing; the earth does not appear to recede away but instead seems distant and removed. The landscape is seen as if the viewer is suspended above the ground at a distance. The viewer cannot easily orient themselves spatially. Nor can the viewer orientate themselves to any particular topographical feature. Space is abstract, symbolic and universalised. In a concession to perspective, a centuries-old method of evoking pictorial depth, the marks that stand for trees, logs and other landscape features, tend to diminish in size, and are more closely bunched together the closer they appear to the horizon or tree line. A curious feature of Upwey landscape and Yellow landscape is that flatness and distance remain distinct and separate entities. They coexist, but are not bridged or linked in any organic or connective way. The two stage process in making the work – first the application of a ‘ground’ and then the superimposed mark making – denies spatial recession. Spaciousness is evoked, distance is declared, but the paintings are flat. Flatness was especially valued as a goal for painting in Williams’ time in keeping with the dominant Formalist ethos, which tended to equate the design qualities of a work of art with its content. Formalism usually cited Cezanne as the ‘father’ of the modern trend in painting to flatness. Yet in Cezanne flatness and distance are linked in an organic and unified painting process. They are linked in a perceptually grounded method: the artist’s mark making registers an experience of ‘being there’ (seeing, perception) while simultaneously acknowledging flatness (as everyone who is conversant with modern painting knows, Cezanne sought to acknowledge that his painting was a construction on a two-dimensional surface). A tension or ambiguity exists between flatness, depth, and distance in Cezanne. But in Williams’ paintings there is a disconnect. This disconnect does not detract from the decorative charm of the work, but rather contributes to its quality of detachment. Williams was seeking to concentrate the viewer’s attention on the surface qualities of his painting, particularly the mark making. Since the ‘ground’ functions as a foil to the mark making it serves to isolate the marks and emphasize their presence. This effect is utterly unlike French Impressionist mark making (as in the landscapes of Claude Monet) where forms are embedded in the spaces and the negative spaces have the same materiality as positive forms. The Impressionist paintings have a unifying shimmer that, for all their attention to the surface qualities of paint and canvas, draw you into the work spatially and atmospherically. The experience of looking at a Williams painting on a gallery wall is different. Viewing Upwey landscape and Yellow landscape in this way the viewer is likely to experience – particularly when up close to the work – that their eye tends to scan the surface in an undirected and random like way. The viewer’s attention is drawn to this mark and then that mark. It can seem as if you are replicating the artist’s own experience of looking in the landscape. True, the marks might not correspond with moments of seeing (as they most probably do in the plein-air painting of Cezanne and Monet); they may more properly be meant as a generalised and symbolic equivalent of experience. Yet the mark making can evoke remembered looking (memory). In this way, Williams’ paintings do reference observation — but at a remove (again, that quality of detachment that is a feature of Williams’ art, particularly from the 1960s). We know that experience of the landscape – a kind of detached observation – was vital to Williams. ‘Observation is the catalyst for me,’ Williams is recorded as saying. It was in the late 1960s that Williams’ painting reached its apogee of minimalist and abstract ‘cool’. The new decade of the 1970s saw a trend in his work to more colour, and a more sensual handling of the paint. Williams was now making a lot of paintings using gouache on paper, and making these on location in the landscape. Some of the most memorable work from the retrospective are gouaches of the seaside at Victoria’s Mornington Peninsula and visited Bass Strait islands. In the 70s Williams was also painting in oils in the landscape, or at least he commenced painting on site and then completed the work in the studio. A charming example from the retrospective of a painting of this kind is Kew Billabong old tyre II (1975), one of a series of Kew billabong paintings. The mark making has an impressionist quality that lends vibrancy to the work, and details like the tyre suggest a human presence. A darkened area at the lower edge of the painting functions as a foreground which orients the viewer spatially. A light and sandy coloured shape (representing the sandy edge to the billabong) draws the viewer into an intimate and enclosed space. You have a sense of being present to the landscape. Kew Billabong old tyre II has an intimacy quite unlike the artist’s painting of the 1960s. In 1979 Williams began a new project when he visited the Pilbara region of Western Australia as the guest of an iron ore mining magnate. Williams researched his subject by taking photos from a light plane and he made a large number of gouaches on the ground. From early 1981 oil paintings of the Pilbara landscape were made in his Melbourne studio. At this time Williams became unwell. He completed the Pilbara series paintings and started no new work. In 1982, at the age of 55, Fred Williams died. The Pilbara paintings are intensely coloured. The series takes full advantage of the rich red colouring of the soil and the layered colouring of the ancient and crumbling rocky headlands and ranges. They are among the most topographically specific of the artist’s oeuvre. 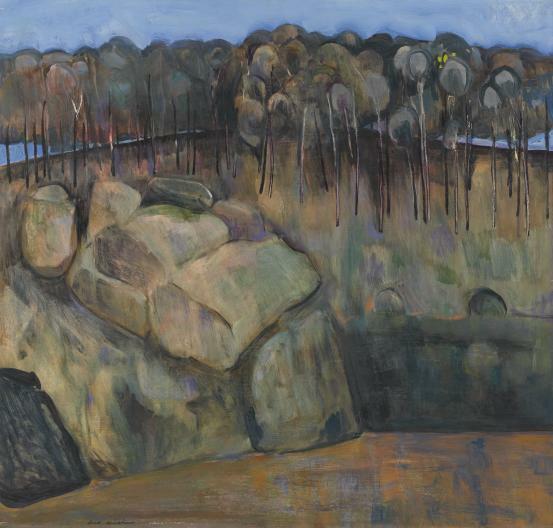 Iron Ore Landscape (1981) is in the collection of the National Gallery of Victoria. The whited out blue sky and use of atmospheric perspective – the scattered trees at the distant horizon are blue and you feel the shimmer of heat and light – is a concession to naturalism. Yet the foregrounded area of the landscape remains flat and decorative and denies the viewer easy access. Clearly, Williams is wanting to address two realities here: the reality of experience (being there in the landscape), and the reality that belongs to painting (the flat picture plane). In Iron Ore Landscape two kinds of spatial organisation – the illusionistic on the one hand and a flattened modernist abstraction on the other – have been collated and occupy different areas of the picture. As with the earlier work, they are not linked or bridged, but coexist. Williams’ concern to convey both distance and flatness arises from his need to accommodate both the experiential (being there) and the abstract (painting). This duality underscores the sensual and decorative appeal of Williams’ art. But it may be that in pursuit of this duality Iron Ore Landscape, like Upwey landscape from the 1960s, is problematic in terms of its spatial construction. How problematic this may be, if at all, depends on subjective notions about what makes for good construction in painting. It is my view that a painting ought to be spatially coherent on its own terms, and I invite the reader to consider whether spatial coherence applies to the paintings I have discussed in this essay. Even today, after three decades of the Postmodern, Williams’ own assessment of his work still holds sway. When you are in a gallery looking at one of the artist’s landscapes its objectness can heighten your awareness of the gallery space itself – that is, the space between yourself and the painting. The landscape does not appear as an extension of your own space, rather you and the painting seem to occupy the same space – the gallery space. The heightened awareness you have of the work’s objectness – and the distancing this encourages – heightens your appreciation of the work’s physical properties. So form becomes content, and the work is seen to abide by that same Formalist framework that underscored its making and reception. Gallery directors James Mollison and Patrick McCaughey, respectively of the National Gallery of Australia and the National Gallery of Victoria, both wrote books about Williams’ art from a formalist perspective, while they acquired his work for their museums. Yet, the passing of time may allow for new ways of contextualising and hence reading Williams’ work. Surely, to allow and encourage this to happen, was a part of the rationale for Infinite Horizons. We now live in a time where the romantic, the sublime and the transcendent are well established in contemporary painting – particularly where landscape is concerned. This phenomenon has been recently documented in Simon Gregg’s book New Romantics: Darkness to Light (2011). This context can encourage a reading of Williams’ work in more romantic terms. While Williams’ landscape painting has been celebrated for its ‘unpicturesque’ and ‘Australian’ (that is ‘non-European’) aesthetic I would suggest that Williams’ landscapes relate to another aesthetic of a romantic persuasion – the sublime. The notion of the sublime is of European origin and came into being as a concept at the same time as the picturesque in the late eighteenth century. Williams’ sublime is not a sublime of grand scenery – of mountains, chasms, storms and disaster that typified the European genre (as in the operatic work of the nineteenth-century English romantic JMW Turner). Williams adapted European derived art conventions of the romantic sublime to Australian (characteristically unpicturesque) conditions. Distance, spaciousness and detachment are conveyed in a pictorial language of Modernist abstraction that simultaneously charms with its decorative, sensual and painterly qualities. This serves to mollify the melancholy mood that can be associated with the sublime, particularly in its more abstract manifestations. The sublime in Williams’ classic paintings is one of heroic spaciousness, emphasising vastness, distance, lack of human presence, stillness and detachment. From the perspective that Williams was a Modernist whose work has romantic associations, the inspirations and influences on the artist become more understandable. We can see why Williams would paint his own version of one of the waterfall paintings by the Australian nineteenth-century romantic Eugene von Guerard. Subsequently, Williams followed in von Guerard’s footsteps, seeing for himself the waterfalls of Victoria and making a memorable series of paintings on the subject. But unlike von Guerard, who had a scientific-like concern for the particularities of nature, Williams represented the landscape in a pictorial language that generalised and universalised experience in an abstract language. It was, Williams said, the ‘essentials’ of the Australian landscape that he wanted to get down. Giving the general priority over the particular, Williams could draw the viewer into a universalising realm beyond and apart from any specific realisation of time and place. For all that, Williams was very much concerned with the character of place – but a character of type or kind rather than the specifics of a view or moment of experience. This ‘essential’ character that Williams wanted was explored in the series format. The collective painting from each of these series, corresponding to differing kinds of landscape, has its own character as painting: Williams’ method was to adapt his pictorial language to the differing character of the various kinds of landscape he investigated – pastoral, forested, outback and seaside. In the light of these aims, we can see why there are no cast shadows in a Williams landscape. To note the time of day – to be time specific – was contrary to the artist’s aims and indeed, to his quest for the sublime. Likewise, there are rarely any references to the vagaries of weather or the changing seasons (the green grass of a Victorian winter or spring is seemingly never acknowledged). In Williams you don’t get that tension between the timeless and the perceptual moment which underpins Cezanne’s sensibility. The detachment characteristic of Williams’ iconic landscapes (even while beauty and sensuality are declared by the paint) enables the viewer to relate to the abstracted whole. The viewer is drawn far from where they are standing. They are encouraged to forget the moment, forget their own physical presence in relation to the landscape, and to float in a disembodied and spatially disoriented way above the landscape. In other words, the viewer is drawn in to the transcendent, a realm beyond the here and now and the everyday. Williams’ engagement with the sublime is less emphatic in his paintings of more intimate spaces, such as the Kew billabong series. But a universalising abstraction still plays a role here too – though balanced with reference to observed particularities and an especially sensual application of colour and paint. Here the sublime is not about being drawn into the distance, or about heroic spaciousness. Here we have a romantic expression that is more grounded in the everyday and in the pleasure afforded by the work’s decorative qualities and textures. As revealed by Williams, the landscape – and by implication nature – can be experienced as both earthy and transcendent. But the paintings do not make you feel you are in nature, or surrounded by landscape. Indeed, nature is represented as other to ourselves. For all the detachment the artist clearly had a great love for the Australian landscape. But it is the sense of otherness that pervades the work that allows Williams’ landscapes to engage a viewer’s transcendent yearnings. The potential for landscape painting to connect with this yearning may be what viewers primarily seek from the genre of landscape painting, whether European or Australian. Dr Mark Dober has a PhD in Fine Art (Painting) from Monash University and is a practising artist. He lives in Melbourne. The book Infinite Horizons, has a superb collection of his work.